In a selenium-deficient area like California, giving your cattle proper supplementation is vital to your operation’s success. 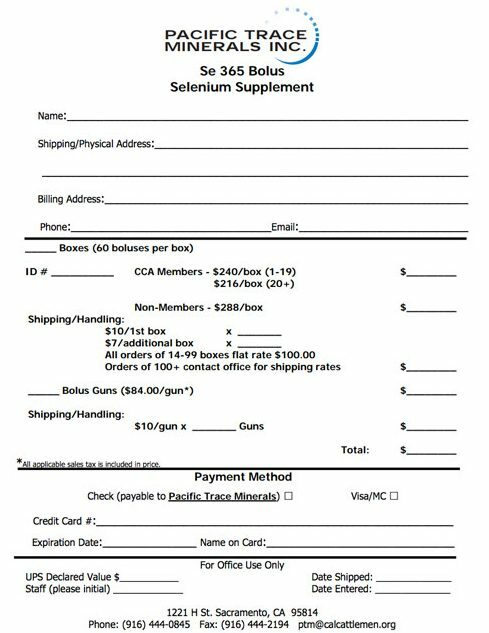 CCA offers the Se365 Selenium Bolus from Pacific Trace Minerals to CCA members at a significant price reduction. Not sure if you should order? Scroll down for answers to producers’ most common questions about the SE365 Selenium Boluses. How common is selenium deficiency? Selenium deficiency is the most commonly diagnosed beef cattle health problem in California. A simple blood sample can be used for analysis to determine if an animal or a herd is normal, deficient or marginal. What are the common signs of selenium deficiency? Selenium deficiency can cause weight loss, diarrhea, poor weight gains, retained placenta, abortions, infertility, poor response to vaccines, white muscle disease, light hair coat, decreased immune response and decreased resistance to disease. How do you give the bolus? The bolus is designed to be given with a standard balling gun. No special equipment is needed. What happens to the bolus in the cow, bull or calf? It sits in the reticulum, the front part of the rumen, and slowly releases selenium. It does not dissolve and causes no harm to the animal. It resides there much as a magnet does when given. How many boluses do you give? Can you give Se 365 bolus with the copper bolus? Yes. The two products can be given together. They do not interfere with each other in any way. Can you give the Se 365 to calves? Yes. The Se 365bolus is safe and effective for calves over 3 months of age. Why is the same size bolus given to adult cattle and calves? The Se 365 bolus provides the maximum allowable amount of selenium to be released to the animal and this level is safe for all ages of cattle. Also, since the calves are growing rapidly their need for selenium is the same as for larger, adult cattle. If a cow is given a Se 365 bolus every year for many years will it harm her? No. Multiple boluses simply sit in the reticulum and do not cause any damage or discomfort. Can you give the Se 365 bolus with other selenium supplements? The Se 365 bolus is not approved for use with other selenium supplements. This is because it provides the maximum allowable selenium supplementation level by itself. If I give the Se 365 bolus to my cow, how will she pass selenium on to her calf? Selenium is passed to the calf during pregnancy very efficiently. The calf will be born with normal levels of selenium if the cow has normal levels. However, at 3-5 months of age the calf will run out of selenium because selenium is not transferred well through the milk. In selenium deficient areas of California both the cow and the calf (3 months of age or older) should receive a Se 365 bolus. Can I give the Se 365 bolus anytime during the year? The Se 365 bolus can be given at any time during the year and is safe for pregnant cows. Is it beneficial to give stocker calves on range or pasture, in selenium- deficient areas, a Se 365 bolus? Yes. Even if a stocker is selenium-normal when it arrives at a deficient area, it will become selenium deficient over a 3-5 month period. Selenium deficiency decreases feed efficiency and selenium deficient calves do not perform well on arrival at the feedlot. What is the shelf life of a bolus? The bolus will last indefinitely. It may rust somewhat if left in damp conditions. Rust will not decrease the effectiveness of the bolus.